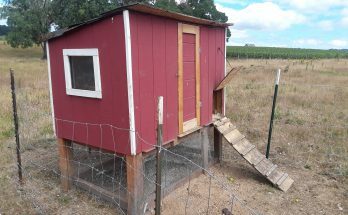 Chicken Feeder - FREE CHICKEN COOP PLANS! If you’ve landed here, you’re contemplating what type of chicken feeder to either buy or make yourself. Either direction is fine, but let’s dissect the issue in the article to help you make the most informed decision. What Makes A Good Chicken Feeder? Does Not Spill A Lot Of Feed (most important) – Feed spillage can cost you a lot of money! Durable – must withstand chickens flying on top of it etc. Holds Enough Feed To Support Your Flock – you don’t want to buy a feeder that’s too small for your flock or you’ll have to refill it all the time. Conversely, you don’t want to buy a huge feeder if you have 2 chickens as the food may get stale. Can Be Moved If Needed – maybe this doesn’t apply to you, but it took ME a while to position my roosts, feeder, and watering system in my own coop and I appreciated the fact that my bucket feeder could be easily re-positioned. As mentioned earlier, chicken feed spillage can be costly. 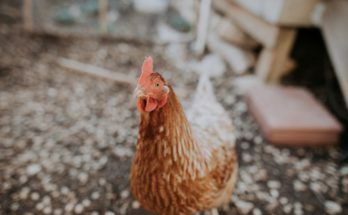 Here are a few ideas to help eliminate, or at least reduce, the amount of chicken feed spilled on the floor from those crazy birds! Place The Eating/Pecking Bin Just Below Beak Level – This Helps A Lot! If it’s positioned too low, they can get their feet in the feed, start scratching it out of the feeder and all over floor – super frustrating! My 5 gallon feeder below is positioned on top of 2 cinder blocks and it’s worked well that way for years! I’ve seen very little spillage placing it at this height. 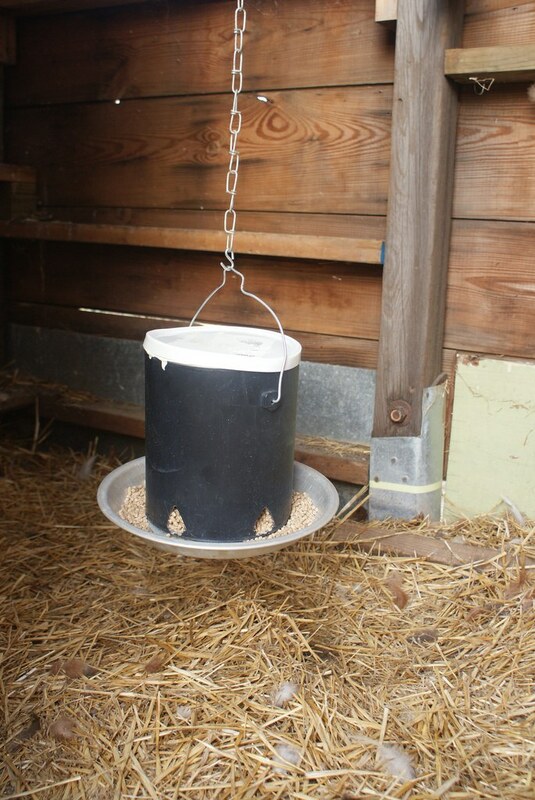 You can also just hang it from a chain or rope from the ceiling supports of your coop to a similar height. You can make these feeders yourself or buy them online. But it will save you a lot of money to buy the pipes at Home Depot, Lowes etc. and they are very easy to assemble! You basically just need some glue to hold the fittings together, and a hack saw to cut the plastic piping to the correct length and that’s it! The farm stores all carry a nice selection of chicken feeders and water containers but they can be rather expensive. I made a 5 gallon feeder and waterer using two 5 gallon buckets I got for free at our local grocery store – usually the bakery or deli section – and two 20 inch plastic planter bases. The plastic planter bases cost around $5.00 – $10.00. I purchased mine from a garage sale. Of course, any local retailer such as Walmart, Target, or your local hardware store would carry them as well. 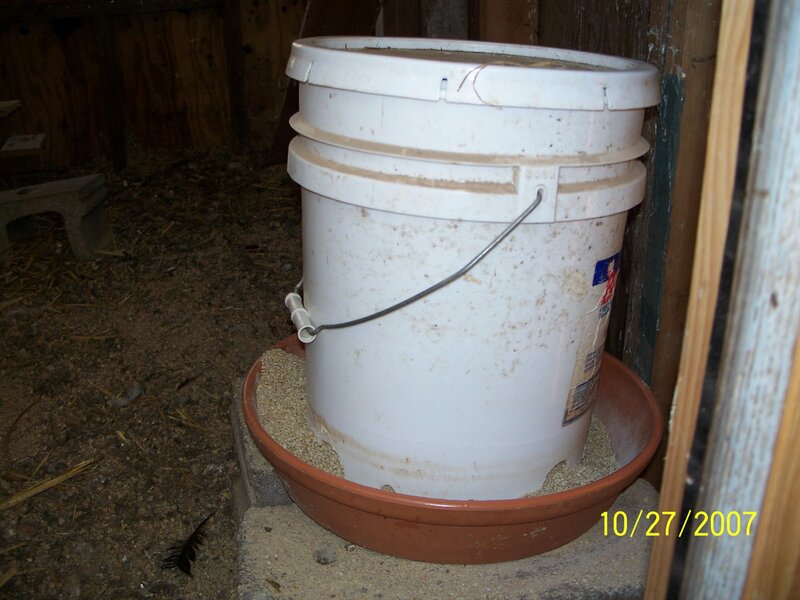 The 5 gallon feeder I’m currently using is pictured below – after filling it with feed, it will last about 3 – 4 weeks for 13 chickens. 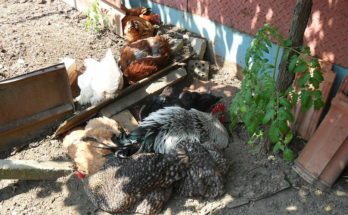 Of note, we also feed our chickens left over veggie scraps, so that may delay how often we need to re-fill it. How it’s done: To make the Chicken feeder – drill several holes about 1 inch to 1 1/2 inch diameter around the bottom of the bucket. 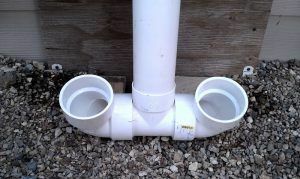 Make sure the bottom edge of the holes are no higher up than 1/2″ from the very bottom of the bucket. Next – place the bucket in the bottom of the plant base so the top of the bucket is still up. Don’t throw away the lid – you’ll still need it. Make sure the bucket is centered as best as possible in the plant bottom and then screw it in place using 3 or 4 screws until it is secure. That’s it! Just pour in the feed and put the lid on and you’ve got 5 gallons worth of feed. I’m guessing this would be roughly 20 lbs of feed since it holds just under half of a 50lb bag of chicken feed in my feeder. I placed my feeder on top of 2 concrete blocks – chickens are sloppy eaters and this helps prevent feed spillage. I’ve seen other people hang their feeders a few inches off the ground with rope. The suggested distance off the ground is about the height of the chickens back. Then drill in 4 – 6 screws around the perimeter, which works great to hold it in place (see picture). The screw length I used was 2 1/2 inches. Don’t forget about those screws in there if you ever need to reach in the bucket. You don’t want to get cut! But that’s all there is to it – You now have an extra large chicken feeder. If you are handy and like working with wood, there are many variations of wood feeders that work swell. Wood chicken feeders can be mounted on the wall an designed in a way which greatly reduces feed waste! But as long as the roof extends well over the bin the feed pours into, that should eliminate that issue. If you have a large flock you can make a large wooden feeder, or simply build several smaller feeders like the one pictured above. These feeders are also really awesome! 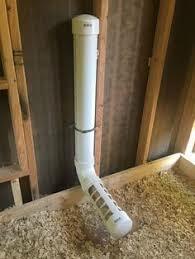 There are a lot of configurations that can be made PVC feeders an excellent choice for your chickens. They are easy to assemble and secure, and they also are made with the “Y” fitting at the bottom – this feature makes for very little mess, a big bonus for most people! There are varying size of PVC piping that can be used, but 3 inch width seems to be the most common. 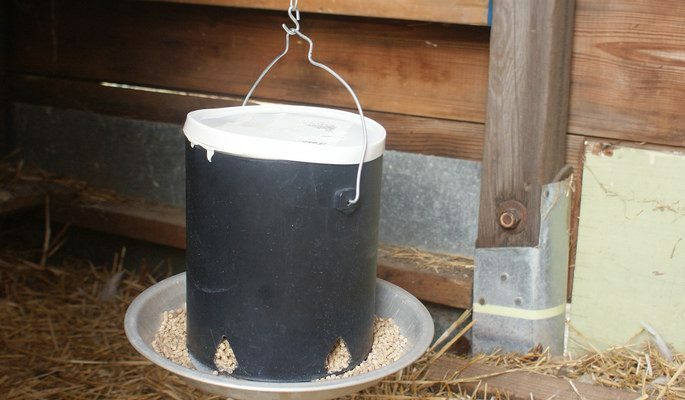 As for feed, chicken mash tends to get bound up in this type of feeder so it works better with chicken feed in crumble or pellet form. My personal favorite is pellets because they tend to spill much less than in either crumble or mash feed. PVC trough feeder. Photo at Pinterest. 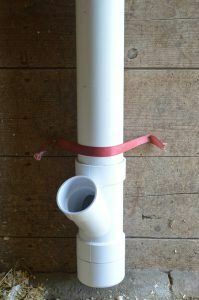 Pictured above is a PVC trough feeder – yet another cool idea of what you can do with PVC! I personally don’t prefer this over the “Y” fitting feeder as I think you lose more feed. 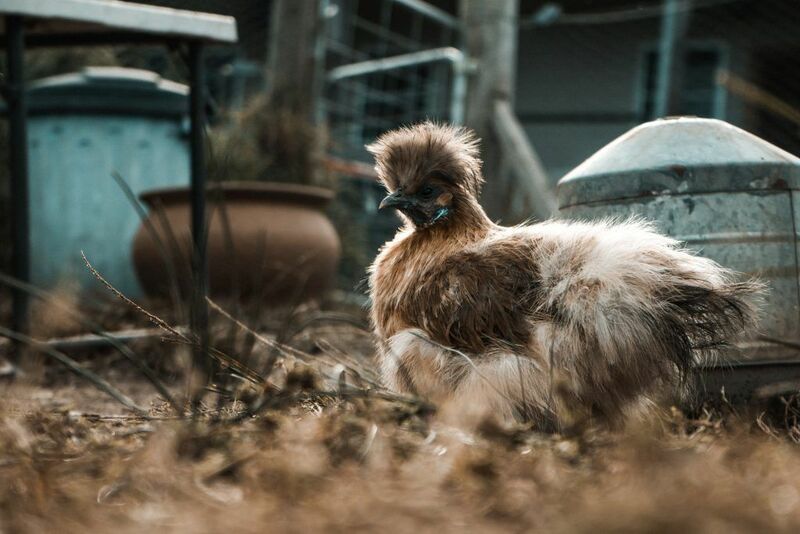 But as with anything – you need to determine what works best for YOU and your chickens. 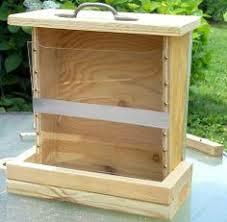 Many of the chicken feeders discussed so far can be made from home. 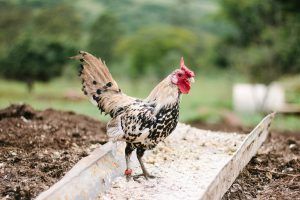 But if you’re not feeling like bringing out the tools and have a bit of extra money laying around, you can always BUY a chicken feeder from a farm store or online. Many companies have free shipping now and there are A LOT of options to choose from. I encourage you to look for coops that are designed for less feed spillage. So even if you pay more upfront for this type of feeder, it’ll save you a lot of money in the end from the amount of money saved in feed costs! I hope you gained a few helpful ideas for buying or making your chicken feeder! I have both made and built chicken feeders and both feeders have worked just fine…but I must admit – I’m partial to making things in my coop by myself when I have the time and gumption to do so. It’s a lot of fun and, for me, it makes me appreciate the critters using it even more! Have a chicken feeder idea of your own? Please tell us about it below- I love hearing new ideas!